Circumstances: Owen was last seen by his carers at a mental care lodge located at 20 Grace Street Lota, Brisbane at 1300hrs on the 24/01/2016. Last to see saw him walking North towards Manly. Owen suffers from a mental condition as well as from Wernicke Korsakoff also called wet brain, Korsakoff's psychosis, and alcoholic encephalopathy. Owen is estranged from his family. Police are appealing for public assistance to locate a man missing from Lota. Owen Lindgreen was last seen at an address in Grace Street around 1pm on Sunday, January 24. 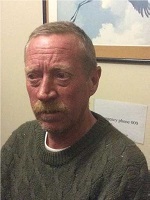 The 55-year-old (pictured) is described as Caucasian, 175cm tall, weighing approximately 80kgs with a proportionate build, and short auburn hair. He was last seen wearing a blue-grey polo shirt and dark grey stripe shorts. Police hold concerns for his safety as he suffers from a medical condition. Anyone who may have seen him or has any information is asked to contact Crime Stoppers on 1800 333 000.